Are you revamping your office to give it a new look? 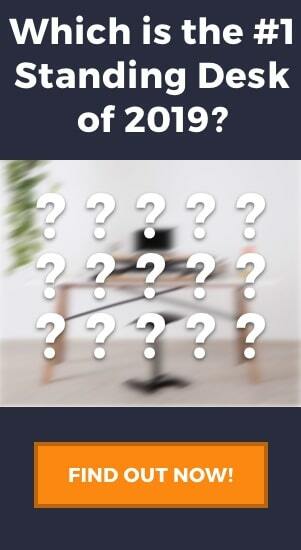 Or upgrading your furniture towards having a more ergonomic office space? 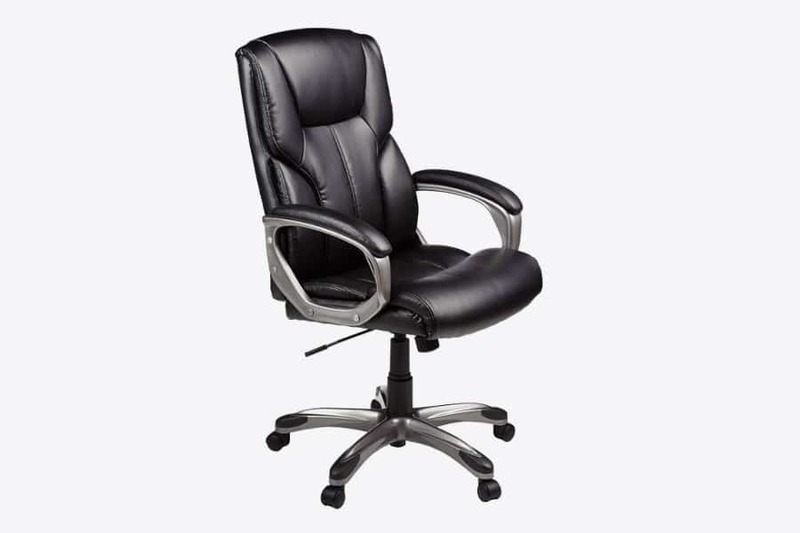 An ergonomic office chair is one of the key pieces of having an ergonomic workstation. 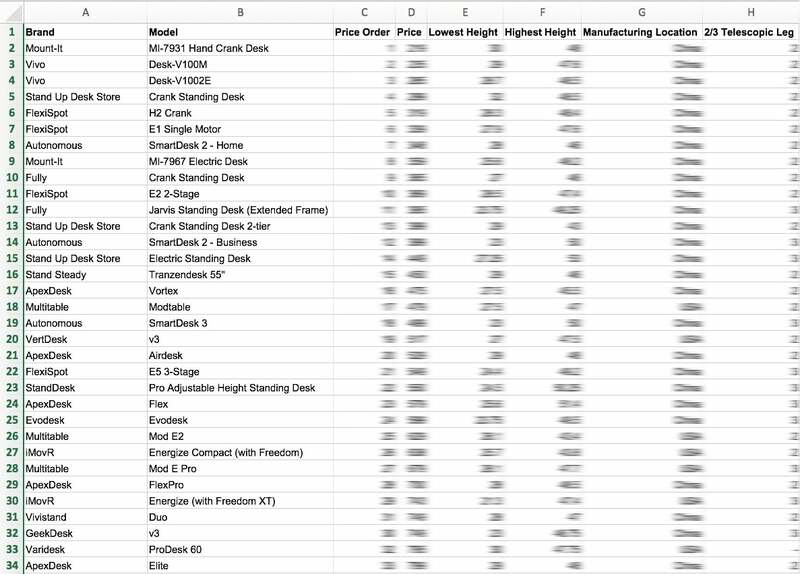 We have been on a roll recently with the standing desk reviews. But let’s face it, even if you have the best standing desk out there, you may not want to be standing 100% of the time. There will be moments when you have to sit down and for that reason, a comfortable and ergonomic chair to sit on is a worthwhile addition to any workstation. It can be tricky to choose a suitable chair. The choices are endless and the variety of options mindboggling at times. A good place to start would be our office chair buying guide which will lay the groundwork for your decision. Here is a roundup of our favorite ergonomic chairs organized by category, starting with the best chair for gaming. If you are a gamer looking for a cushy chair to plop yourself in for hours of continuous gaming, look no further than the Devoko Ergonomic Racing Style Gaming Chair. The bucket seat and cushioning make the Devoko an exceptionally comfortable chair. Apart from the cozy cushioning, both the freely adjustable lumbar support pad and the headrest have been much appreciated by the gamers who have bought this chair. Assembly of this ergonomic gaming chair is straightforward as it comes with an instruction manual. Most users could put it together in 30 minutes. 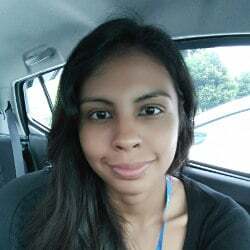 If you do struggle for whatever reason, the company is known for its good customer support, and customer support reps have even reached out to help clients who write negative reviews. At just under $100, this is an affordable gaming chair. 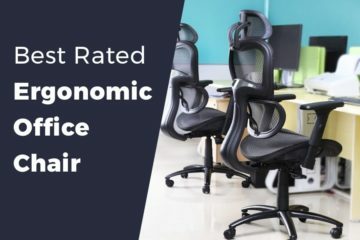 Ergonomic furniture can often be expensive, but the Devoko is a good opportunity to enjoy an ergonomic chair for not much more than a standard office chair. Just in case you are not happy with the chair, Devoko offers a free replacement or refund within 30 days of purchase. The warranty is for 6 months and covers free replacement for any damaged or defective parts. Also, the Devoko is one cool looking chair that comes in 5 colors for you to choose from. You are bound to find a color that fits your décor. To avoid the dreaded sweaty leather feeling but still preserve the luxurious appearance, the manufacturers have chosen to cover this chair in breathable leather. One major drawback of this chair is the armrests. Firstly, they are not height adjustable, meaning you can’t adjust them to fit your individual body. Using armrests fixed at awkward angles could place undue pressure on your elbows and wrists. Secondly, some people have found them to be a bit on the low side, getting in the way of optimal comfort. Finally, unlike the rest of the chair, the armrests are not padded but just covered with cushioned rubber. 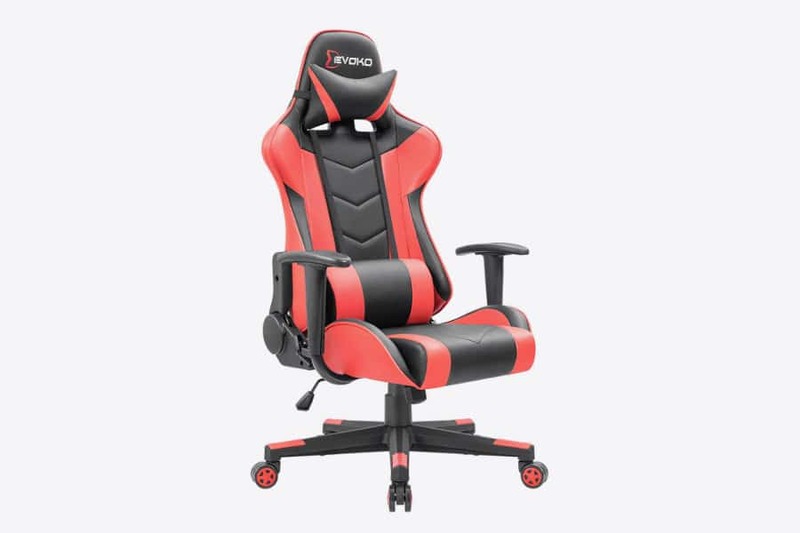 If the Devoko gaming chair isn’t your top choice, another good alternative would be the Homall Gaming Chair Racing Style High Back PU Leather Chair. As mentioned in our The Ultimate Ergonomic Office Chair Buying Guide, the back of your chair is an important factor as it supports your upper back, neck, and shoulders. The best high back chairs will provide you with the best support for your spine, such as our top pick, the Komene Ergonomic Mesh High Back Office Chair. The high back of this ergonomic chair gives you extra support for your neck. Even though it is best to take frequent breaks while working, long hours at the desk are sometimes unavoidable. To prevent the backache that often happens after sitting for too long, the Komene chair comes with a reclining option that enables you to stretch your back to 135 degrees. Even with the back of the chair at a 90-degree angle, the backrest is slightly curved in order to provide you with adequate lumbar support. Adjusting the angle of the chair is easy as the Komene has an adjuster on right to adjust the tilt angle of the backrest, chair height and tilt tension. But keep in mind, the lumbar support is not adjustable. Some reviewers have complained of it being positioned too high for their height. Great news for taller folks out there – the armrests on the Komene chair are height adjustable! They can also be tilted left, right, forwards and backward, so you can adjust to your heart’s content to find the perfect position for you. Plus, the armrests are padded for extra comfort. The entire seat and back of this chair are covered in breathable mesh material. The seat is also slightly elastic, so it conforms to your body more tightly when you sit. However, the mesh fabric can also be a drawback. One user who mostly wears shorts and tank tops complained of the mesh pressing into the skin. Currently, this chair is only available in black. It looks perfectly acceptable but may seem a little boring if you are looking to jazz up the appearance of your office. 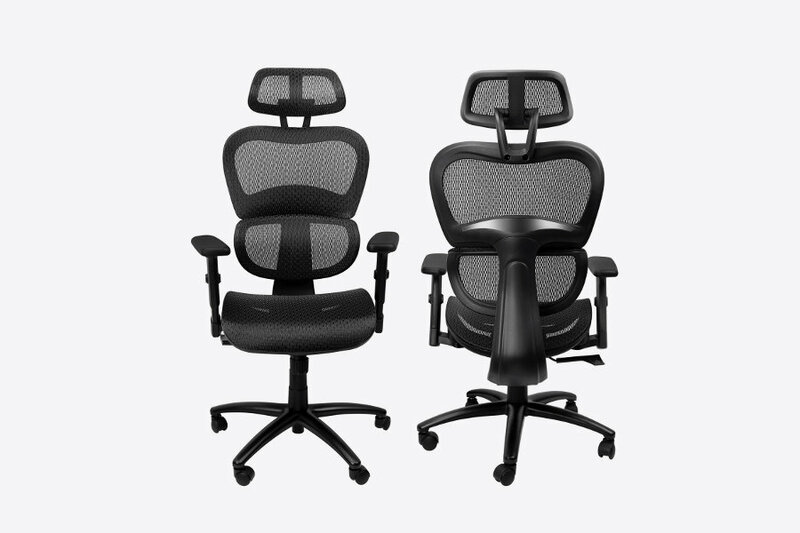 Overall, we love the Komene Ergonomic High-Back chair and recommend it highly. Just be aware of the little drawbacks such as the fixed-in-place lumbar support. Perhaps the appearance of a high-back chair is not to your liking, or maybe you don’t sit for long hours and don’t need that level of support. Well, an alternative to the high-back chair would be the mid-back chair. 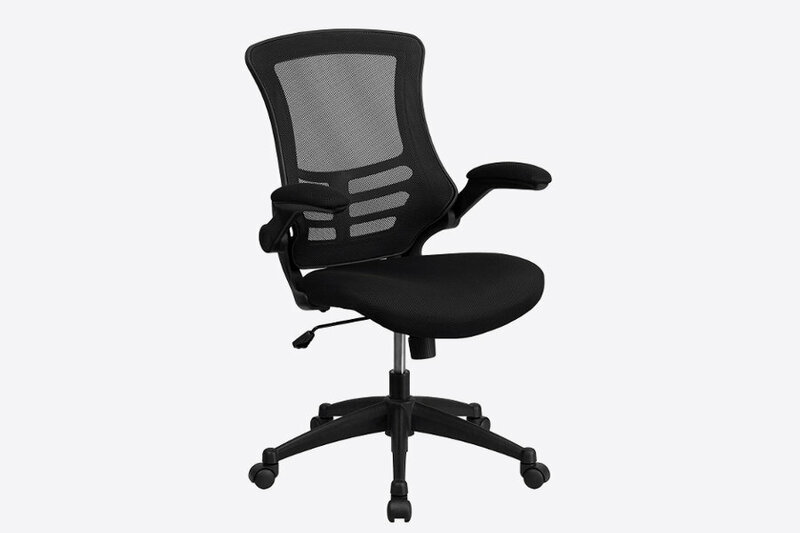 Our favorite mid-back model is the Flash Furniture Mid-Back Black Mesh Swivel Task Chair with Flip-Up Arms. The height of this chair is adjustable between 17.25 inches and 20.75 inches. To move the seat up and down, you can use the pneumatic seat height adjustment lever located underneath the seat. There is also a tilt tension adjustment knob to adjust the amount of tension in the tilt of the chair. This knob also lets you lock the seat in place. The chair is covered with leather upholstery for the seat and arms, but the back consists of a mesh type fabric. This is the perfect combination of comfortable seating and good ventilation to avoid the dreaded sticky back. The seat size is an average size of 20.25 inches in width and 19 inches in depth, and it’s soft enough to be comfortable but does not flatten over time. Also, multiple reviews have praised the ergonomics of this chair. 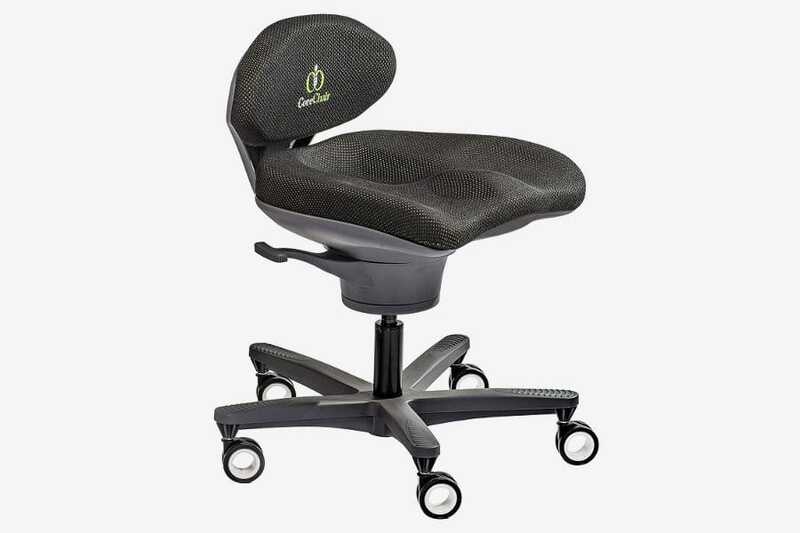 Users with back problems and pelvic pain have explicitly stated how this ergonomic chair has reduced the amount of pain they are in at the end of the day. To top things off, the assembly is easy as it comes in only 6 pieces with a packet of screws that are well labeled. Apart from adjustments to the height, the rest of this chair quite fixed. The lack of adjustments makes it less flexible if you have very specific requirements from a chair. Not only that, the armrests of the chair are fixed at an awkward height for some people. One user complained that the armrests bumped into the table when using the chair. But despite these shortcomings, the Flash Furniture Mid-Back ergonomic office chair remains a worthwhile purchase as it sells at a very reasonable price. Kneeling chairs were first made in the 1960s by Norwegian inventors. The very first kneeling chair, the Balans chair, is quite similar to the modern kneeling chair of today. These chairs aim to promote better posture and back health by changing the weight distribution of your body as you sit. When compared to the traditional chair, the kneeling chair works its magic by placing less pressure on your lower back and spine, thus reducing the dreaded problem of chronic back pain. Our top choice for the best kneeling chair on the market is the DRAGONN Ergonomic Kneeling Chair. One common concern people have when it comes to kneeling chairs is knee pain from the pressure of the kneepads. To counteract any possible discomfort, the Dragonn kneeling chair comes with 3 inches of cushioning for the seat as well as both knee areas. This is significantly more cushioning than the average kneeling chair and it makes the experience of using the Dragonn very comfortable. These cushions are covered with faux leather, giving the kneeling chair an elegant and luxurious look. The height of the Dragonn kneeling chair can be adjusted between 21 to 28 inches, making it a good choice even for tall people. It also has an adequate weight capacity of 250 pounds. As the base is made of metal, a solid and durable material, the chair is sturdy and can live up to its stated weight capacity. The casters that come with the kneeling chair aim to offer mobility and safety. They allow you to move on different surfaces and two of the casters can be locked to keep you safely in place without sliding around unintentionally. However, some users have complaints about the quality of the casters. There have been reports that they don’t move as smoothly as they could, and moving this kneeling chair sideways is a problem. If lockable casters are not something that you need, an alternative kneeling chair to consider would be the Sleekform Ergonomic Kneeling Chair. As it comes with rollerblade wheels, the mobility of the Sleekform is better than the Dragonn but you do not have the option to lock the Sleekform kneeling chair in place. The Sleekform chair is also slightly tall, so it may not fit well under shorter desks. Coming back to the Dragonn, with overwhelmingly positive reviews that rave about the ergonomics and quality of this kneeling chair, we feel this is truly one of the best kneeling chairs out there. After taking into consideration the affordable price tag and easy assembly, it’s a steal. If you are looking for more kneeling chair reviews, we have discussed them in more detail in our article on the best kneeling chairs on the market. Does ‘active sitting’ sound like a contradiction to you? We hope not! Sitting still or sitting passively for long periods of time has been associated with many health conditions such as obesity and heart disease. Forget about an apple a day, staying active at work will go a long way in keeping the doctor away. One effective way to do that is to get an active chair, a seating option that makes you move. One of the best active chairs out there is the Core Chair active chair. This funky looking chair was inspired by the exercise ball and it aims to get your core muscles activated throughout the day. The main way it achieves this subtle abdominal muscle engagement is both simple and ingenious – the seat of the Core Chair tilts all the way around to a maximum angle of 14 degrees. This is enough of a tilt that you need to activate your core to stay balanced, but not too much of a tilt that you risk falling off. Of course, if you need to give your muscles a break and just sit completely relaxed, there is the option to adjust the tension level to a degree where there is almost zero tilt. The tension is adjusted via a lever that is easily reached while sitting on the chair. Also, reviews have found that the tilting motion is smooth in all directions at all tension levels. Even though there isn’t much of a back to the chair, it still provides adequate support in the form of a small cushioned lumbar support called the ‘pelvic stabilizer’. As an added advantage, the lumbar support is adjustable via a lever on the left, so you can position the back to properly fit the curvature of your spine. At first glance, you may notice that the seat of the Core Chair looks unusual. Indeed, it is not the usual flat seat you find on your average office chair. The sculpted ergonomic seat is designed to fit the contours of your body. This would give you comfort and also avoid unnecessary pressure on your legs from sitting. 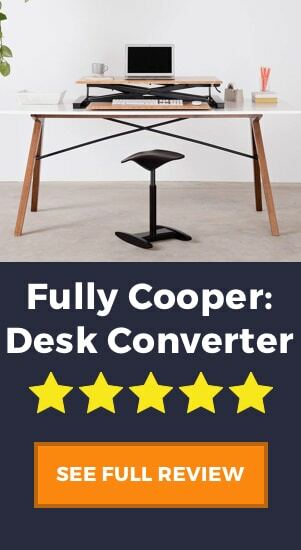 Tall people rejoice – Core Chair has made a special Tall Version of the standard chair! The Tall version has a minimum height of 18.7 inches and a maximum height of 22.3 inches. For comparison, the standard version has a height range of 17.1 inches to 19.2 inches. 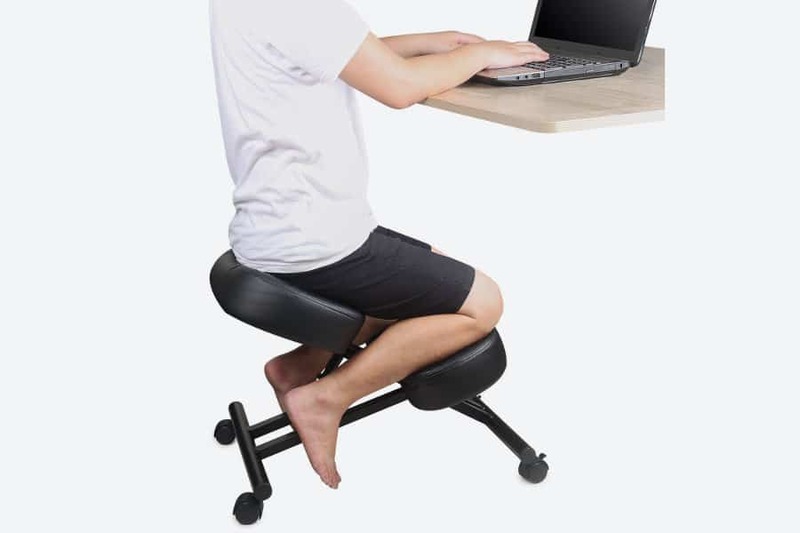 The extra height of 3 inches will go a long way in making the active chair experience more comfortable for a taller person. The Core Chair also comes in different colors for you to choose from. They are divided into two different styles, the Knit Cushion Style which comes in Black on Green, or the Sport Cushion Style which is available in a choice of black, blue or gray. The chair is well made and it exudes quality. But just in case, the Core Chair is covered by an excellent warranty period of 12 years. At a retail price of $795, this is not a cheap office chair. However, depending on your needs and priorities, it could be a worthwhile investment. The ergonomics are fantastic, it would give your core muscles a workout, the build quality is top notch and the 12-year warranty is the icing on the cake. As mentioned before, going ergonomic does not mean having to break the bank. There are plenty of affordable ergonomic chairs to choose from, but the one that tops our list is the AmazonBasics Executive Swivel Chair. If there is one word that keeps being mentioned across most of the reviews on this office chair, it is ‘comfortable’. The comfort level of this cushioned swivel chair is definitely satisfying, and you can sit for hours in it without getting sore. The ergonomic back design supports your spine adequately and as the back of the chair is tall enough to support your head and neck, you are encouraged to sit up in a healthy posture without slumping. This AmazonBasics chair is covered bonded black leather and PVC. The faux leather seats, generously padded armrests and pewter finish all work together to give the AmazonBasics High Back Chair a sophisticated look. It will surely blend in seamlessly in any professional office environment. The height of the chair can be adjusted within the reasonable range of 41.34 to 45.08 inches. The tilt tension of the chair can also be adjusted via a knob on the underside of the seat. Assembly is a breeze. This chair comes in only 3 major parts, and all screws, as well as the Allen key, is provided along with a handy instruction manual. When the chair is new, it is sturdy and does a good job of accommodating taller or heavier people. The weight capacity is 250 lbs. At under $150 on Amazon for a brand new high-back chair, this is a good deal. For added peace of mind, it is covered by a 1-year limited warranty. While this chair is affordable and comfortable out of the box, there are concerns about the durability of it. There have been some comments that the PVC leather fabric does not hold up for long and starts peeling after only a few years. Users have also mentioned a squeaking sound when leaning back in the chair – which may be a little distracting as you work. Long story short: if you are looking for an even more economical option, AmazonBasics has got you covered. We hope this list helped you choose the best ergonomic office chair to suit your needs. A good ergonomic chair is truly worth the investment, especially if you spend a good portion of your day seated. Above all, remember to always keep moving and take frequent walking breaks – at the end of the day, your body will thank you for it!